“A sepulchral tomb. Magical tricks and traps. Brutish orcs guarding a vast underground treasure.” This is how Orcs in Tarodun’s Tomb describes the “quintessential first-time D&D experience” it seeks to recapture in this beginner-oriented scenario. It rings a Pavlovian bell. Many of us have played this adventure in one way or another. In your case, it might have been Keep on the Borderlands. In my case, it was a mine, and my character was killed by the orcs in one of the early rooms, but close enough. I don’t think Orcs in Tarodun’s Tomb is a good low-level orcs-in-a-hole module, and I will outline why below. they share the same premise and aesthetics (vanilla fantasy, both rooted in their respective era). 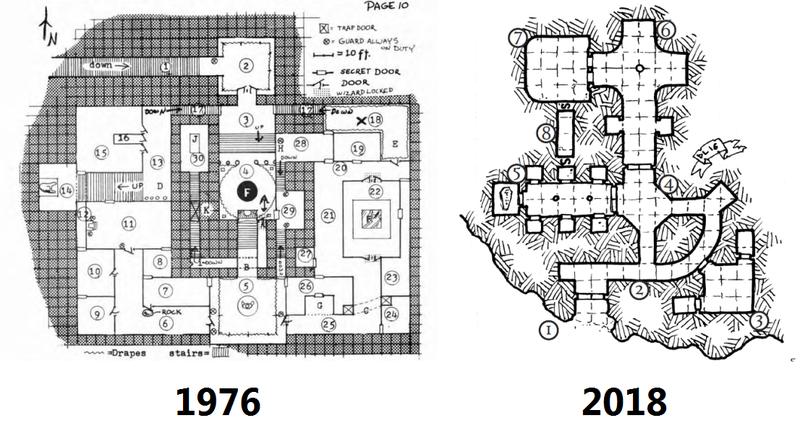 And yet, Borshak’s makes for a hell of a beginner mini-dungeon, and Tarodun’s doesn’t. What makes for the difference? I have said it before, but here it is again: like most of the modern mini-adventures, this one lacks scope. In its day, Borshak’s Lair would have been considered a mini-dungeon: nevertheless, it has 29 encounter areas, and it is brimming with creative encounters. Based on a circular layout, it is a small, complex environment divided between a humanoid-inhabited western, and a haunted eastern half; it is full of magical enigmas, tricks, and secrets, and there are oodles of vicious combat with hordes of enemies. In comparison, Tarodun’s Tomb is an eight-room lair: mostly a linear sequence of encounters with a mini-boss, a puzzle, and a final boss. Even considering changes in the style of play since the 1970s, and the more involved tactical combat of recent editions, this is a huge difference, and a shame. The width and complexity of Borshak’s opens up the playing field to enable strategic decision-making within a fairly compact space: there are many ways the scenario may play out, the players (or the orcs) may use the terrain to their advantage, and there are numerous exploration opportunities. You will never find everything in Borshak’s, but you will find a lot of stuff even if you don’t pay too much attention. 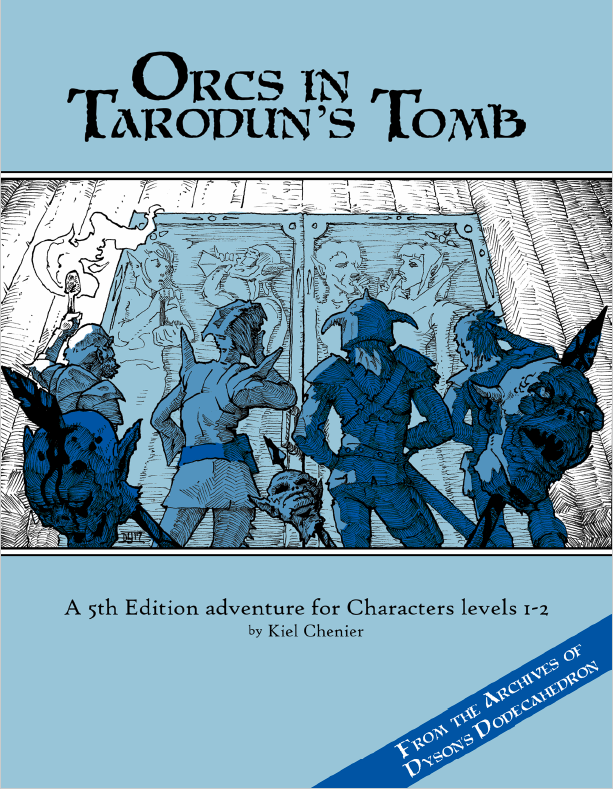 Tarodun’s Tomb does not offer these possibilities: you can’t do much more than move through the dungeon and deal with the encounters as the GM dictates the pace. Even if you find everything, you will not come away with much. It is bite-sized, and linear. There are differences in the approaches you can take. Physical space does have an effect: where there are multiple routes through, you can find more or less direct approaches, try stealth or an ambush (essential against numerical superiority), and perhaps even avoid the denizens directly in your way. There are even voluminous drapes to hide behind and exploit. In a linear lair dungeon, these possibilities are not present. The same goes for a more social approach. In Borshak, only two of the orcs (their Hero leader, and a magic-user underling) have personalities, but the presence of different dungeon groups may be exploited as different factions (although it is not known if this was a common thing in the 70s, it features heavily in Jaquays’ later work). In Tarodun’s, although the orcs are suggested to be women, and they can be customised through an optional random table, the possibilities of out-of-the-box play are more restricted. Admittedly, there is a shortcut allowing the company to “hack” the adventure by either making off with the treasure with minimal confrontation, or letting two opposing forces in the mini-dungeon fight it out. This is very nice, and the best thing about the module, but there is too little of it. The encounters have a different depth in the two modules. Tarodun’s doesn’t offer much beyond a little descriptive detail and some extra looting. The encounters are functional, but one-note. There is an inexplicable double-cross where an NPC saved from certain and painful death will decide to fight her saviours (who are bound to outnumber and outclass her) to the death. This is, no offence, dumb and a terrible lesson for beginners; the absolute nadir of the adventure. There is a central “keyhole puzzle” gating off an area which has one way through (two if we include the secret shortcut). This is not a good thing. You can’t do much with it. Borshak’s Lair is brimming with ideas. There is an intelligent magic amulet who can be an asset or a huge liability. The central area has a “bottomless pit” teleporting you into an insidious trap, an evil orc prank, and five ways forward through secret passages (some of which can also be used to hide baddies who can assault the PCs from all sides). In the next room, there is an animated statue who is really a cursed Hero compelled to fight the party. In the middle of the barracks area, there are four statues with special powers/functions. It is funhouse design, but you can fiddle with things, find secrets, and secrets-within-secrets-within secrets (there is a trap containing treasure, concealing another treasure hoard guarded by a dangerous monster). Finally, let’s consider the module’s suitability for the “quintessential first-time D&D experience”. There is a philosophy which says first adventures should have training wheels, and should not be too overwhelming. I don’t think this is a good approach, particularly in the age of ubiquitous, affordable digital entertainment. Providing a focus for play is fine (“here be orcs and treasure, have at them!”), but I fully believe RPGs should be sold by highlighting their full creative potential. In a truncated scenario, you will find out the game’s limitations (slower pace, lack of visual stimulus), but never discover its versatility and freedom. 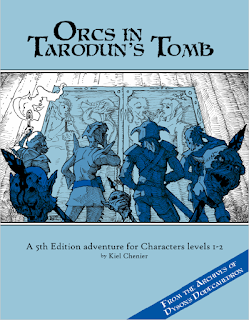 Tarodun’s Tomb has the same limits as every eight-rooms-in-16-pages module on RPGNow. You don’t get Borshak’s compact-but-complex experience, and you don’t even get the Caves of Chaos from The Keep on the Borderlands (let alone the full, rich B2 experience with the Keep’s intrigue, the killer wilderness, and the digressions hinting at a wider world). You get one cave, and for all the ‘Bree Yark’ it can provide, the magic of interlocking mini-dungeons, the mystery of several cave mouths opening before you in the sides of a ravine, the hazards of picking the more dangerous areas are not present. Tarodun’s Tomb does not serve as a good gateway to gaming: it is a cat’s flap into a 10’ by 10’ supply closet, with orcs. This adventure module is not badly written (in fact, the text is fairly terse and well-presented via bullet-point lists), and the information is structured efficiently. The map is pleasing to look at, with good cross-hatching. The stock illustrations are nice. I like the cover. But it is not a good scenario, for beginners or otherwise. Where recent old-school offerings are considered, get Tomb of the Serpent Kings, a far superior beginner scenario with all its structural issues (just in quantitative terms, 52 keyed areas in 22 pages) and forget this one. Or roll up a YUGE party of retainers and hangers-on, and go for broke in the Caves of Chaos or Borshak’s Lair. No playtesters are listed in this publication. Spot on analysis. I'd like to see more old vs old-school comparisons. It's often hard to find parallels where the two products correspond well, but I'll take it into consideration. I'm sure there are dozen keeps on all kinds of borderlands. Maybe I should do one with Keep on the Borderlands vs Little Keep on the Borderlands vs Frandor's Keep someday. Not even a bad module, just "KotB but with a different layout". What do you think a _good_ clone of KotB would look like? - as a beginner scenario, it should introduce "the D&D experience" with its freedom, sense of wonder, and some of its complexity.